Week 18 of MLS Action was one of polar results. Amidst the action was a goal fest in Seattle, a card fest in New England and Real Madrid put down the Galaxy with ease. Couple that with the Women's World Cup final and the soccer fan was certainly treated to some enternaining moments. Here's a recap of what went on within the league. The Sounders were able to come away with 3 points at home against Colorado and continue their push up the Western Conference standings in a wildly entertaining game. The 36,424 fans were treated to an open game that saw a total of 7 goals and plenty of chippy fouls on both sides. The game had 5 cautions dealt but easily could have had a Red card as well after Pablo Mastroeni luckily escaped a second yellow in the first half. Colorado opened the scoring with a quick goal within the opening minute of play from Wells Thompson after some poor defensive clearing by Seattle. Alvaro Fernandez quickly answered with the equalizer in the 7' with a great finish after a brilliant through ball by Osvaldo Alonso. The remainder of the first half saw pretty even play from both sides until the 42', when Jeff Larentowicz took a ball from Wells Thompson at the top of the box and blasted a shot off the far post and into the opposite side netting. Although the Sounders were down at the end of the 1st half, the 2nd belonged to them. Roger Levesque evened the score in the 48' after a clever little flick in front of the net from a Rosales cross. Seattle took the lead in the 82' minute after Freddy Montero nodded home a diving header following a Matt Pickens' deflection. Maurio Rosales sealed the game for Seattle two minutes later after receiving a chipped through ball behind the defense from Freddy Montero. Seattle sent their fans home happy and may have sent Sir Alex Ferguson, who was in attendance to scout the Sounders ahead of their Wednesday night match-up with Man U, with some things to consider. The Crew and Earthquakes played to yet another MLS scoreless draw. Even on a night when the Crew honored Crew and US Men's National Team legend Brian McBride in front of 14, 109 fans, neither team could find the back of the net. It wasn't for the lack of trying, however. Both teams had a few quality chances to put one away but as has been the case with both clubs all season, their goalkeepers came up huge. The Earthquake's Busch denied a Robbie Rogers' shot that was bound for the far post after he slipped behind the defense on a 3 on 1 break in the 43'. Busch almost played play-maker in the 61' when his goal kick bounced over the head of a leaping Chad Marshall and found Simon Dawkins. He tried to slip a shot past Columbus' Will Hesmer but the keeper made an almost Jumping Jack like kick save to deny Dawkins. The Crew had the next quality chance to score in the 74' when Mendoza found himself 1 on 1 with Busch after a fortunate deflection off an Earthquake's player. However, Busch came up big again and denied Mendoza with a right footed kick save. Last season's Golden Boot winner, Chris Wondolowski, had the last quality chance on the night after he headed a great cross toward the Colombus goal, but Hesmer came up with another amazing save to ensure the scoreless draw. Both teams entered the match looking to change their recent run of form for the better. Chicago have accumulated a league leading 12 draws this season and lost their last outing while Portland was riding a 3 game losing streak. Things appeared to be heading in the wrong direction for Portland early on when Defender Kevin Goldwaithe crumbled to the floor with what looked to be a knee injury in the 9'. Their luck looked to turn in the 16' when Diego Chara had a chance at goal but Chicago's Sean Johnson got down quick to his left to make the save. Their luck did change in the 23' when another Chara shot deflected to Jorge Perlaza in the penalty box. Chicago defender Gonzalo Segares got a slight touch on Perlaza who went down and earned his team a controversial penalty kick. Jack Jewsbury converted the penalty, putting the Timbers ahead in the match, and initiating a rain of boos from the 16,419 at Toyota Park. Marco Pappa tried to bring the Fire back into the match personally in the 37' after dribbling past a number of Timbers and taking a curling shot that was parried away by a diving Troy Perkins. The Fire had another great opportunity in the 44' when a Daniel Paladini corner was headed by Corey Gibbs at the near post, but the header banged off the crossbar. The Fire made life harder for themselves in the 63' after Yamith Cuesta picked up a second yellow in the span of 10 minutes and was sent off, leaving the Fire with 10 men for the remainder of the game. But just a couple of minutes later the Fire had a golden opportunity to tie when a Marco Pappa free kick took a deflection in the box and fell to an open Orr Barouch, but his shot also found the crossbar and not the back of the net. Chicago's Pappa was denied in near back-to-back shots by Troy Perkins to close the game leaving the Fire empty handed and continuing their poor form. Kansas City brought a 10 game unbeaten streak into Houston on Saturday and were looking to extend it. It was Houston, however, that got on the board first and put the streak in jeopardy. Brad Davis's left foot sent a curling free kick over the wall and sneaking into the near post in the 8'. Houston continued to put pressure on the Kansas City defense for the remainder of the half but they stood strong and went into the 2nd half only down 1 goal. Things seemed to turn in Kansas City's favor when Colin Clark saw a straight red card in the 51' in a frustrated two footed tackle on KC's Colin. KC almost capitalized on the man advantage a few minutes later when CJ Sapong slipped past the Houston defense and tried to put the ball past Tally Hall with a cheeky shot with the outside of his foot, but Hall was able to make the save. In the 69' Colin once again provided Kansas City with an unintentional big boost after Brian Ching took a big swing and connected with his right leg after losing the ball to him. KC, now up 2 men searched for the equalizer. They finally found the equalizer in the 90' by the feet of none other than Aurelien Colin, who had played the unintentional hero earlier in the night by receiving the brunt of two retaliatory fouls by Houston's Ching and Clark. Although Colin had every intention to score, an unintentional deflection on his shot sent Hall the other way and gave KC their much needed equalizing goal, silencing the 12, 047 fans in attendance and extending their unbeaten streak to 11 games. Dallas and DC were coming off of two drastically different results the previous week. The United had pulled off an unlikely victory against the East leading Red Bulls at Red Bulls Arena while Dallas who had been on a tear, suffered a tough loss against Real Salt Lake at Rio Tinto. There was not much in the way of offense on the night from either team as each team looked a little slow on the night which could have been a factor of the 100 degree temperature and high humidity at Pizza Hut Park. The 10,802 fans didn't see a real scoring chance until the 67' when Marvin Chavez picked Ethan White's pocket around mid-field and then raced in on Bill Hamid's goal. Chavez pushed his shot just wide of the net and the game remained scoreless. Jackson had another decent chance to give FC Dallas the lead in the 87', but his header dinged off the top of the crossbar. As seems the case more often than not, Chivas USA was playing second fiddle to the Galaxy in Los Angeles. However, this time it proved appropriate since the Galaxy and Real Madrid game not only showcased bigger names and greater talent than Chivas, but they also produced 5 goals in their game as compared to 0 goals for Chivas USA and New York. Although there weren't any goals, New York did produce the better chances as their new DP signing, goalkeeper Frank Rost, only had to come up with 1 save. New York's first chance came in the 21' when Teemu Tainio lobbed a nonchalant pass toward the Chivas goal that took a high bounce over Michael Lahoud. It feel to Joel Lindpere who took one touch and sent a low shot to the far post that Dan Kennedy saved to his left. New York had another half decent chance at goal when Jan Gunnar Soli sent a rocket from about 30 yards out that hit off the crossbar following a scary sequence for Chivas' defense. Chivas' best scoring opportunity of the night came in the 38' when Jorge Flores took a Justin Braun through ball and sent a rocket towards NY's goal that banged off the crossbar. New York's golden opportunity came off of Juan Agudelo's head after he found some space behind the Chivas defense and Joel Lindpere sent him a great curling cross. Agudelo's header went right at Dan Kennedy, barely forcing the keeper to make a save. At the end of the night the 14,838 fans at the Home Depot Center went home empty handed. 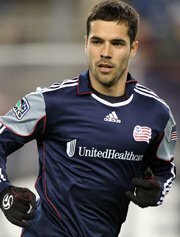 The New England Revolution and Philadelphia Union match-up was one of opposite ends of the Eastern Conference table. The Revolution was without two key defensive players in Ryan Cochrane and Sharlie Joseph due to suspension. The Union took quick advantage of the Revs defensive weakness in the 11' when Carlos Ruiz started and ended a fantastic sequence. Ruiz started with a flicked ball to Justin Mapp who sent a far post cross to Daniel who headed it back toward the center where an unmarked Carlos Ruiz finished the play with a flying volley into the back of the net. The 24' saw the Union take a 2 goal lead when Nakazawa sent a free kick deep into the box that LeToux headed back toward the center of the box where Valdez, who was also left unmarked, finished with another flying volley past New England's Matt Reis. The Revs threatened in the 51' when Chris Tierney's shot rattled the upper corner of the bar. In the 66' New England did not make the match any easier on themselves when Benny Feilhaber saw his second yellow on the night after a foul on Carlos Ruiza, putting the Revs down a man for the remainder of the night. The Union put sustained pressure on Matt Reis' net for the rest of the night forcing him to make some stellar saves. However, in the 93' the Union's Sheanon Williams finally put one by Reis giving the Union an impressive 3-0 victory in front of 13,414 disappointed Revs fans at Gillete Stadium.